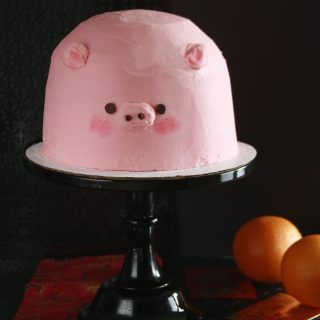 I knew that I wanted to make an eclectic and unexpected cake. While shopping through Sweetapolita’s sprinkle shop, the “How Bazaar” sprinkle medley inspired me further to do something non traditional. For a long time I wanted to make a spiced cake, but I knew that cinnamon was beyond boring and overdone. As the weather cools down and the days get darker, I crave for something exciting. The cake does just the trick! This Market Bazaar Cake does not focus on any specific location. Instead each component is inspired by flavors of far off lands. At least far from this cold North East existence. 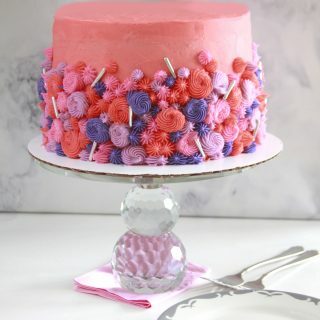 I wanted to make a cake with flavors and spices you’d find in street side market stalls. These sort of flavors have Middle Eastern, Indian, and Mediterranean culinary roots. Yet things like tahini, turmeric, and lassis are not go-to dessert flavors—at least not at first glance. More conventional dessert flavors are honey, pistachio, orange blossoms, and rose. However to me, these floral flavors are gross. I’ve never met a floral flavor dessert I’ve liked. It’s always a delicate balance that’s seldom achieved. So many times I have bitten into way desserts that have tasted like old lady perfume. 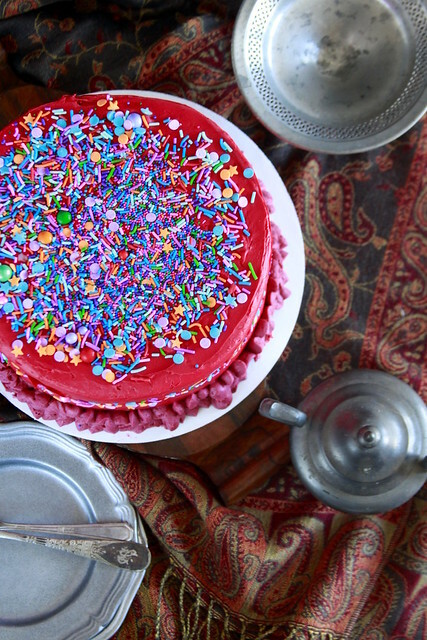 The cake flavor is inspired by the Lebanese dessert sfoof. 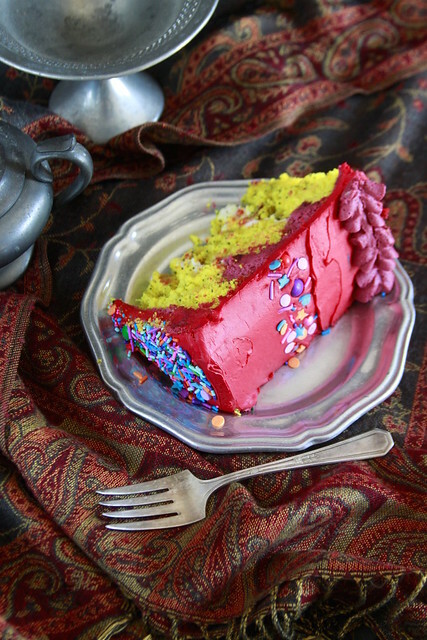 Unlike sfoof, this turmeric cake is a high ratio cake. 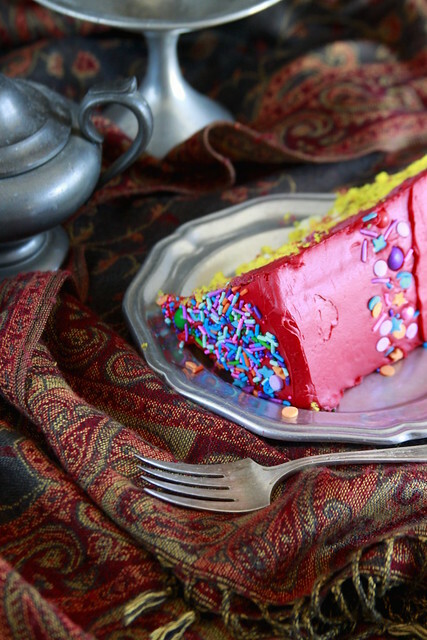 This means that is it moister, sweeter, and more classically an American cake in texture. 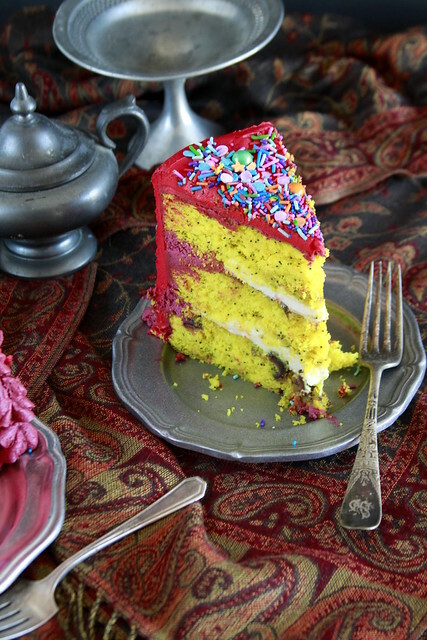 There is just enough turmeric to flavor the cake without being overwhelming. You may think I edited the photos to exaggerate the saturation, but I did not. The turmeric creates a gorgeously intense yellow color. 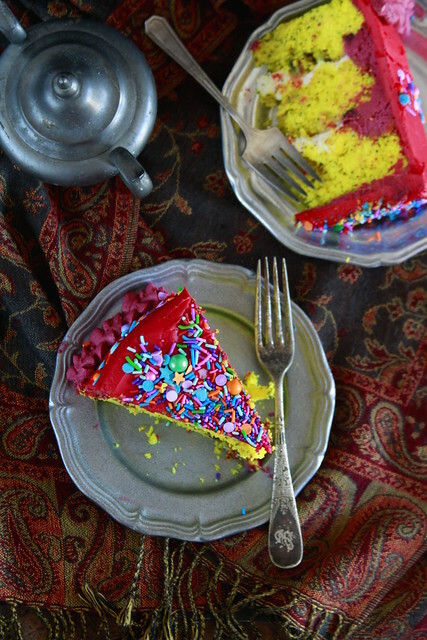 To make the Market Bazaar cake more eclectic, I added chopped dates and poppy seeds. The Market Bazaar Cake’s filling is indicative of the Indian lassi drink. Rather than using plain yogurt, I used Greek yogurt for it’s thick sturdier structure. Though there are many flavors of lassi—orange blossom, rosewater, and mango—I decided to make keep the filling simple and added a drop vanilla. 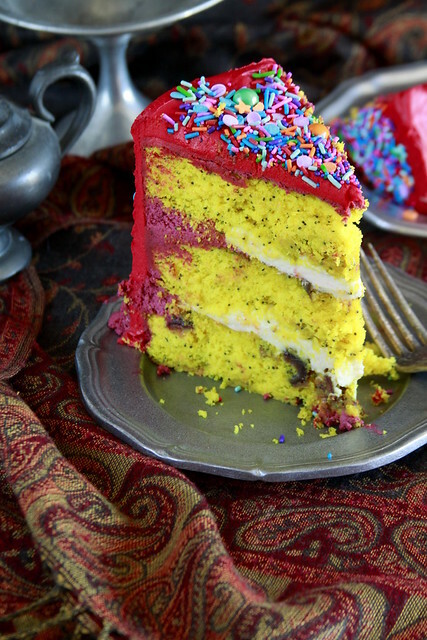 This milky clean flavor of the Lassi Filling balances all of the textures and flavors of the cake layers. 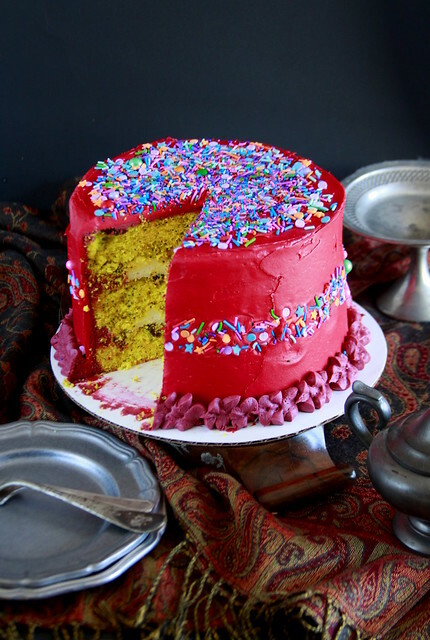 The Market Bazaar Cake is covered in a tahini frosting. Unlike my previous sesame cake, this frosting does not need a lot of sesame seed paste. Just ¼ of a cup provides ample toasty sesame flavor. 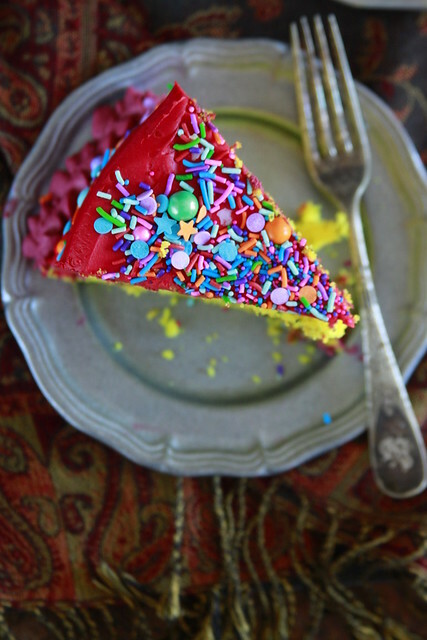 Covered with these sprinkles brings so much color. 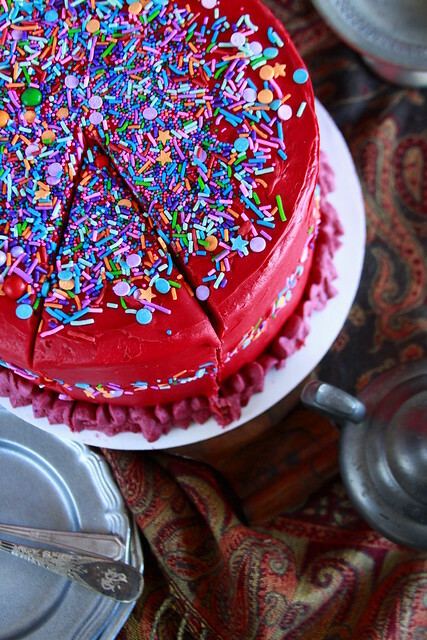 As I’m sitting in this cold November existence, this Market Bazaar Cake takes me on a trip to a crowded and exciting market place full of spices and vibrant color! In the bowl of a stand mixer sift the cake flour, all-purpose flour, baking powder, salt, sugar, and turmeric. Mix on a low speed for 10 seconds to just stir all of it together. Meanwhile whisk the yogurt, vanilla, and egg yolks together. Toss the dates with the flour. Add the poppy seeds and dates, stirring for 20 more seconds. Stir the batter by hand to ensure everything is incorporated. Beat the cream cheese in a stand mixer fitted with a paddle attachment. Once smooth and lump free, add the Greek yogurt, flour, powdered sugar, vanillas, and salt. Beat until smooth. Refrigerate until assembly. Beat butter and cream cheese on a medium speed until smooth and lump free. Scrape the bowl as needed. Gradually add the powder sugar followed by the tahini. 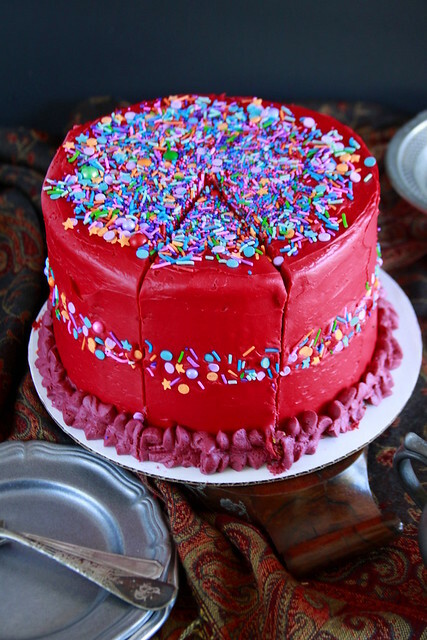 Tint the frosting to the desired shade of red. 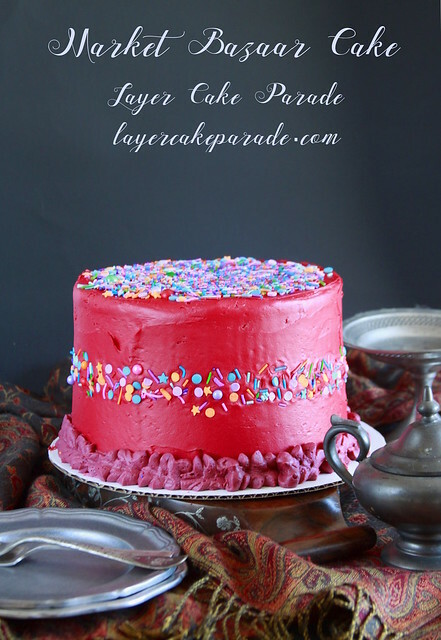 If the cake layers have domes, use a serrated knife to level off the tops. 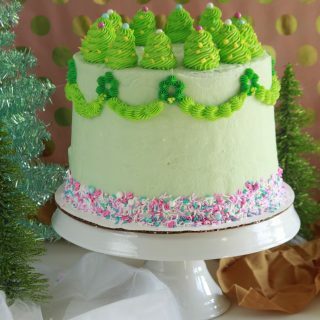 Secure the first layer to the cake board with a bit of frosting. 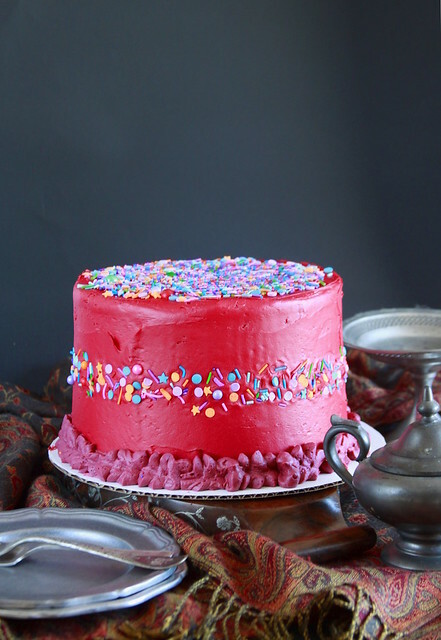 Apply ring of Red Tahini Frosting around the perimeter, creating a moat to hold the filling in. Spoon in the Lassi Filling, add the next layer and repeat. Top with the final third layer. Give the cake an initial crumb coating. Chill for 15 minutes. 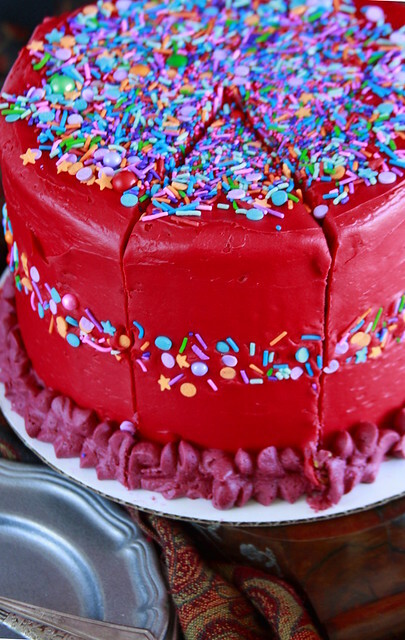 Apply a thicker, second layer of the Tahini Frosting. Chill for another 15 minutes. 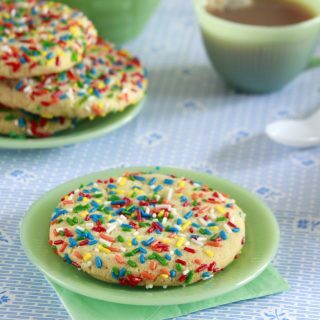 Apply Sprinkles and decorate as desired.